The cottage sleeps 4 plus baby, with 3 bedrooms. The owners are happy to accept more than one well behaved dog. (No extra charge for dogs). This comfortable, well-presented cottage is set in idyllic country surroundings. It is an ideal base for families, walkers and cyclists, or those of you who just want to chill and soak up the tranquility. 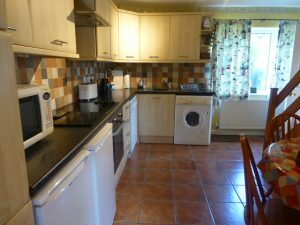 The cottage is adjoined to the owners house in an extremely quiet, country lane, yet central to all locations in Pembrokeshire. dishwasher and washing machine. Kitchen table and chairs. Lounge. 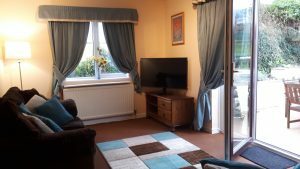 Flat screen TV with Freeview, DVD and HiFi. French windows to rear patio. Toddler play table and chairs. Bedroom 1 with double bed, TV. Bedroom 2 with single bed, Freeview TV. Bedroom 3 with single bed, Freeview TV. (All bedrooms have a sloping ceiling. Bedroom 1 has a Velux window, Bedrooms 2 & 3 have views over the surrounding countryside). Front lawn (not enclosed) with picnic table. Surrounded by rural farmland. Parking space for 2 vehicles. Steps to cottage from driveway. Rent inclusive of electricity and oil central heating. Duvets, bed linen and towels provided. 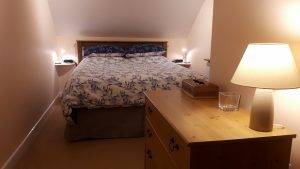 Lovely clean cottage ***** Steve D.
Lovely clean cottage well stocked with everything you could need chocolate and wine welcome gift was a very nice touch not to mention the fresh eggs. We can’t fault this place and would not hestitate in recommending to friends and family. 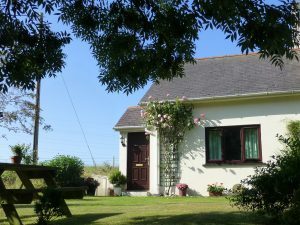 Lovely comfortable cottage ***** Deborah M.
We wanted a week to do some walking and enjoy our new puppy. I also wanted to revisit areas of my childhood family holidays and can say without hesitation that it was a wonderful week. We were delighted to meet Barrie and Christine on our arrival and we’re over the moon with our cottage and it’s location. We had some lovely walks, great breakfasts thanks to the gifts from the chickens and enjoyed the wine and chocolate from our welcome tray. We have not found a cottage that is so well equipped; it has everything you could possible want and more. We will certainly revisit and cannot recommend it highly enough.